It’s not everyday that thy almighty cider gods bestow the pleasure of a truly heavenly beverage to us simple mere mortals. But today I caught a glimpse of what cider heaven must taste like, leaving me truly blessed. This cider I speak of that comes to us in biblical proportions is made by Bill George and Andrew Gronow, of Gywnt y Ddraig in Wales. This highly awarded cider is the special reserve blend which utilises fruit from Welsh orchards and oak ageing. The colour is beautifully dark and tawny, and is filtered brilliant. The carbonation is quite low, leaving no real evidence of fizz in the glass. The nose is an intense experience being rich, highly complex and traditional. Fresh apple characters hit you at first which then are proceeded by cherry cola, vanilla, caramel, leathery earth and musty nuances. There is a tiny bit of acetic acid (vinegar), along with a smidgen of brettanomyces (bandaid) to add a little more complexity. This is a nose which tells an amazing story of tradition from the ageing orchards all the way to the old oak vats. Pure bliss in a glass. The palate offered up an addictive medium sweetness of what seemed to be comprised of bittersweet apples. This made the mouth feel lush, rich and very full. A small amount of natural acid cut its way through the sweetness which left a tart finish. Tannin was low possibly due to oxidative practises whilst making the cider, but a nice level of bitterness was met on the back palate. The palate was very fresh and had a lovely length of stewed apples with the 6.5 per cent alcohol being perfectly balanced. This cider is a beautiful Welsh farmhouse example, and comes with an amazing amount of interest, complexity and flavour. It really makes you think that this is what real farmhouse cider could have tasted like 100 years ago in the UK. A truly memorable experience and the beauty is that this cider is available in Australia. Domaine Dupont without doubt is the more highly recognized and acclaimed French cider producer which you can find in Australia – Just ahead of Le Pere Jules in my opinion. From a company who specializes mostly in calvados (like many Normandy producers), Domaine Dupont produces some fantastic traditional ciders. Now pay attention! Domaine Dupont is located in the commune Victot-Pontfol, which is in the area of the Pays d’Auge. These two are located in the department of Calvados, with all three situated in the region of Normandy – Phew, get all that!! Pay d’Auge also has the special rank of being an AOC or Appellation Controlee region, for its calvados and cider production too (which was thanks to Etienne Dupont, the current owner of Domaine Dupont). Victot-Pontfol is also only a short 40Km drive east from the ancient Norman city of Caen. The Dupont story is a fascinating one which is entrenched in deep history and pride. Many French producers are proud of their heritage, which often dates back many centuries. The earliest known Dupont in Normandy was recorded all the way back in 1703, where calvados and cider was being produced amongst cattle farming. 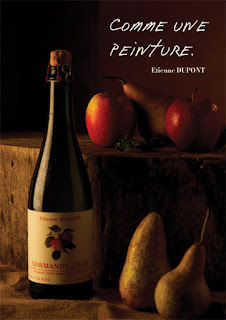 Today, and over three centuries later, Etienne Dupont along with his son Jerome Dupont are continuing the family traditions and making quality calvados and cider (along with other apple based beverages). The Domaine, or better known as the Louis Dupont Family estate, has over 30 hectares of premium, low nutrient soiled orchards which home over 6000 trees with 13 different varieties. These varieties are not your well known offerings and you have probably not heard about them. These include French varieties like: Petit Jaune, Judor, Rouge Duret, Noel des Champs and Bisquet. Some varieties you probably have heard about are Binet Rouge and Frequin – as I have mentioned them throughout my many reviews. But these apple varieties are beautiful and all blend together their bittersweet, acid, sweet and bitter components harmoniously to make a gracious French cider. My mouth is just watering right now! I also love the quote Domaine Dupont state regarding their apples used- “High quality apples are vital to the creation of a great cider”. The ciders are made fairly traditionally, with the apples scrupulously washed and sorted with rotten apples discarded. The apples are milled, and then pressed at very high pressures to extract all tannins and flavour fast. This is in complete contrast to white wine making, where to press a white you need to have a slow build up of a very gentle pressure. The juice is let to ferment in vats with wild yeast, racked, then bottled for final fermentation in bottle for natural carbonation without pasteurisation. Right, now let’s actually get to the cider (finally). This Cidre Bouche is a neat looking Frenchy, and with an alcohol around 5 per cent, this suggests it’s a brut (dry). The colour is a beautiful yellow straw, and the cider itself is slightly hazy with tiny yeast deposits in the bottom of the bottle. On opening, the cork is relieved with a loud, and quite forceful I must admit, “POP”. There was lots of pressure built up under that baby, so watch out when opening. Pouring into the glass, I expected a raging torrent of foam and bubbles, but the mousse behaved itself and faded reasonably fast into to a constant bead. The nose on initial inspection, offered up wild yeasty notes of some cheesy funk (all good). There were beautiful notes of dustiness and mushroom earthiness which complimented the up front green apple, and zingy apple fruit bowl characters. Subtle honey and woody aromas completed the whole nose and added more mouth watering complexity. On warming up a touch, other secondary characters of hessian, and caramel combined with vanilla greeted you like an old mate in the street. The nose as a whole is not as rustic as a traditional French farmhouse cidre, but the layers of complexity will blow your mind. On consumption, I couldn’t escape this crazy wet dog hair character which was pretty ‘in your face’. It was like my pet black Labrador Maisie jumped in a creek then decide to jump all over me giving me a sloppy kiss – well that’s how I would describe it. But the irony is I love my dog even when she has wet smelly hair, as do I with a French cider. Get my drift? So I had the gusto, to look over this and find more pleasing characters – and I did. The cider came across as brut, with just a touch of apple sweetness that rounded out the mouth feel. The carbonation created a lovely softness, combined with an iddy biddy bit of bitterness on the back palate. There was no real tannin or astringency influence, but the acidity was crisp and focused giving off a sherbet note. The balance between the bittershaprs and acidic apples was beautifully blended. The lovely length of pineapples, apples and creaminess was delightful too. The palate was well rounded and balanced, but very simple at the same time. This is a straightforward Cidre Bouche palate, but will sure please. So really, this cider is quite refreshing offering itself up to being quite a session drink. This is because it’s easy to drink with a comfortable 5 per cent, it’s not offensive in any way, and is inviting and soft. This cider is not setting the world on fire, but is a great example from the talented makers at Domaine Dupont. I really liked this cider due to its simplicity and tendency to not over complicate things. A real reliable cider that is sure to please. The brilliant folk at the Bristol Cider Shop in England have just sent me over 12 traditional West Country ciders. Do you think I'm just a little excited? Oh hell yes!! So over the early part of the new year, i will be doing special reviews on these special ciders. These ciders are all unavailable in Australia, but least i can give a detailed description of what true, authentic and traditional cider tastes like (easy for me to say as i am the one tasting them). I can't wait to start reviewing these, but also just to sit down and savour the amazing moments. It's not every day ciders of this stature from the West Country rock up in Australia. I also can't wait to share my views with all you readers! The Mornington Peninsula is another one of Australia’s premier wine growing regions which is situated south east of Melbourne, in Victoria. The Peninsula is only a short one hour drive from Melbourne, and is home to many attractions like vineyards, pristine coast lines and national parks. It's also home to amazing regional produce including: seafood, seasonal fruits, meats and my favourite – apples! This is one really cool part of Australia. Rebello Wines is one company from the Peninsula who are successfully utilising their produce through making wines, liqueurs and now cider. Matt and Ruth Gallace’s family have a long and entrenched history in the Mornington Peninsula through farming strawberries. But the couple broke ties with the family business over seven years ago and begun Rebello Wines (Rebello meaning ‘rebel’ in Italian). Cheeky Rascal is the name of Rebello’s cider line, and seems to depict the company profile well. This by not taking themselves too seriously, and also to respect traditions and heritage. I like that a lot. Their cider lines which include apple cider, pear cider, mulled cider and a vast array of fruit flavoured ciders are really kicking goals with popularity at an all time high. I recently read that back in February of this year, Cheeky Rascal was up to 45,000 litres per month in production to keep up demand! Yike-a-rooney!!! That is a huge effort to all concerned. The cider is also proud of its no concentrates, flavourings or colours philosophy – which is becoming a common catch cry for new Aussie ciders. *This bottle was purchased with a bag of spices attached to make a mulled cider. My personal preference is to review ciders with no additives, or fruit flavourings so the spices were left out. On opening, there was a loud “whoosh” of gas which leaped out like a genie in a bottle. Pouring into the glass, there was a vicious explosion of bubbles, which succumbed to gravity fairly fast. There was a strong and steady bead in the glass too, almost representing a fine French Champagne. The colour was a pale straw colour, very common with eating apple ciders. Nose wise, the overall experience was clean and pure. Lovely fresh, floral notes invaded the glass followed by attractive pear, candy cane (must be the Christmas fever hitting me) and confectionery musk characters. There was also an evident stewed apple character, almost resembling golden delicious which was an interesting addition. Finally a touch of a bruised granny smith character, which closely resembled aldehyde added another layer (an aroma of bruised green apples which is the direct result of ethanol being oxidised). The palate was some what disappointing and a real surprise. Initially, the off dry sweetness made for a fuller style, but this rapidly vanished through the mid to back palate by a weird, almost apple core/seed bitterness. The back palate was ambushed entirely by the high 8 per cent alcohol content. The thin and lighter nature of the cider coupled with the 8 per cent alcohol is a little scary – especially in the 330mL bottles. This is one cider you may not want to drink if you’re driving, as it will creep up on you very fast. The acid was good giving the mouth feel some crispness, and there were some nice fresh green apple characters. There was no textural component evident due to the eating apples used. Overall, the palate was a little ‘plain Jane’ and a touch too one dimensional for my liking. This is as simple as a palate can get in a cider. I just felt the whole palate was a tiny bit disjointed, with out of balance alcohol, thin fruit weight and apple seed bitterness. Not taking anything away from this apple cider, but this is definitely a good example of why eating/dessert apple ciders struggle to emulate its cider apple cousins. It was very straight forward and seemed to be made to a recipe. Also with culinary apples comes higher alcohol levels, and this cider struggled trying to mask that. Perhaps the whole experience would have changed if the spices were added, but that is not for me to work out. In my honest opinion, there are many more interesting and generous ciders on the market in Australia right now compared to this. But if this is a cider you have not tried yet and are interested, then by all means give it a go. If you haven’t tried a mulled cider either, then this cider could be up you alley. For me, this cider just lacked interest, and for someone who has a short attention span (as I am a male), I need all the interest I can get. So right now as I speak, there is an alcoholic beverage that is hopping onto the popularity train and about to catch up to its mate cider. I am talking about alcoholic ginger beer. With its intense ginger and aromatic flavourings, it’s a beautiful drink which takes skill to successfully make right. It has that charisma about it which I am sure will win over many new fans and be consumed in large quantities this summer. Already we are seeing an influx of traditional English examples making their way into Australia. Just like cider, I am confident we will see an explosion of great craft ginger beers being produced in Australia in the not so distant future. There are a few decent Australian examples kicking around at present, but with Bulmers now releasing their ginger beer to the Australian market, the popularity will undoubtedly rise fast (Obviously because a select group of consumes still think for some weird reason that Bulmers is the best cider you can buy!!). I can really see ginger beer being a highly successful alternative to beer or cider if made right. The key to ginger beer is refreshment, refreshment, refreshment. And what do parched Aussie palates crave on a hot 40 degree summer day? You bet ya, refreshment!! So I thought I would start reviewing ginger beers from time to time amongst the cider, as I have always been a huge fan of the stuff – if anyone doesn’t like Bundaberg non alcoholic ginger beer then you’re crazy. Also anything made at a craft level be it beer, cider or ginger beer then I am sold. The reviews will have no scores, but a general description of my opinions and observations and will be a little more informal to what my cider reviews are. It’s all just a little bit of fun! So the first little baby I found on my travels is made by East Ninth Brewing, from Melbourne who are also the makers of Fog City cider. Everything is sourced from New Zealand for this product, and it sits at a modest 4 per cent alcohol in an amazing, old school 660mL hand grenade bottle. The ginger beer pours nice and cloudy, the way it should be. What I would love to have seen was some real ginger chunks floating in the glass – but that’s just being picky really. The carbonation was light in excitement, and faded fast. The nose offered up intense ginger spice which travelled straight up your nose and lingered for eternity. Beautiful hints of vanilla, dried herbs and a faint touch of orange all intergraded harmoniously with the ginger. There were also some secondary nuances of caramel and petroleum jelly – weird I know! The palate offered up lovely upfront sweetness which was washed away by a high tide of refreshing dryness. Flavours on the palate included the obvious gingery notes, but also subtle orange peel, and citrus. The 4 per cent alcohol gave nice warmth too. This is a nice little ginger beer, with good sweetness and balance. I loved the aromatics used, and it all seemed to tie in well. A really good effort, and well worth a try. Bress Wine, Cider and Produce are a company residing in Harcourt which is Victoria’s mecca of apple growing, especially traditional cider apples. Harcourt is located around 122km’s north from Victoria’s capital Melbourne, which is a short 1.5 hour drive up the Calder Freeway (to all you International readers). Bress specialise first and for most in wine and cider, but also branch out into small boutique products like olive oil, honey, relishes and pickles. Adam Marks along with his wife Lynne are the brains trust behind Bress and have been making wine in Harcourt since 2001. In terms of cider, Bress sit on an impressive 14 acre apple and pear orchard which is home to nine different cider apple varieties (40 years old) and 4 different perry pear varieties (30 years old). Not that many Australian cider producers can say that they have 14 acres of premium cider fruit at over 30 years old at their disposal. The orchard is also farmed biodynamically too which gives great confidence that the fruit will be superior. The cooler climate of Harcourt also aids in higher quality fruit being produced. I have said it many times before, but this (traditional apples and pears) is the future of Australian cider, and Bress are miles ahead of the game. The cider made at Bress draw on the history and tradition of the farmhouse styles made in Normandy, France. The philosophy of the Bress cider is quite simple, but in the long run very effective. It’s focused on minimal intervention - let the fruit be the hero, its mouth feel, texture, complexity and tradition. These characteristics are only now being understood and recognised by Australian cider producers. Yes, I am all for Australia having it’s own identity in terms of cider style, but heck, when you have a producer like Bress making cider true to a style which has been steeped in history for a thousand years, then it’s hard not to get excited. The proof is in the pudding!! The Bon Bon, is the sweeter brother of the Bress Brut offering. In France, remember Brut means ‘dry’, so the Bon Bon would be labelled Bress Doux – which means ‘sweet’. The cider comes in a large 750mL sparkling wine bottle with a crown seal closure. I absolutely love the silver label too with the large chook as the logo – really cool presentation. On pouring into the glass, the colour was a real deep golden straw being the results of the use of cider apples and oak storage. Being disgorged, this cider should have had a little cloudiness to it, but what I saw in my glass was clear and brilliant. The natural secondary fermentation gave off a lower mousse in the glass and this was a pleasant to see. The nose was very complex, and super inviting and I found I could not stop sniffing it! It had a real distinct sharpness about it, which could have been the result of a large proportion of bittersharps being used in the blend e.g. Kingston Black. Some characters which were evident consisted of freshly picked green apples, pineapples and nashi pears. A beautiful floral character also rounded out the whole experience. There was also some oaky notes and wild ferment funkiness which all tied in perfectly. Really, this nose was rich, bold and meant business from the word go. It was open, aromatic and gave off a heap of interest for what the palate had to offer. On initial inspection of the palate, the medium sweetness filled out the palate sensationally. This was a real treat. The sweetness was balanced out with good natural acidity too. I enjoyed the rich, luscious apple sweetness being infiltrated also by an attacking sharpness - pure bliss. A lovely creaminess from the 6 months of less contact gave some texture and a tiny hit of phenolics and bitterness. The carbonation also played a leading role, lifting the palate to another level. The overall structure of the cider was very tight and tidy, and it’s a ‘what you see is what you get’ kind of experience. One thing to keep in mind is the 10 per cent - yes 10 per cent! !, alcohol level. Sure, this cider is nice and sweet, and goes down well, but that higher level of alcohol can really creep up on you and bite you in the arse. The higher levels seemed a little out of balance and made the back palate very hot indeed. From my experience, cider can handle higher alcohols well, but this cider may just be stepping over that fine line. Normandy (and Brittany) ciders are usually not this high in alcohol, with the sweeter options usually keeved or arrested at around the 2 to 5 per cent alcohol range. But this is the Bress style, and i am all for it. This cider hailing from the Harcourt Valley is a real insight into what Australian cider makers can achieve if they have the right materials. She’s big, bold, unrelenting and unremorseful with her whopping 10 per cent alcohol. This isn’t a cider to take lightly. But if treated right, it will reward you with an amazing cider experience which takes you back to Normandy. The Bress team need to be congratulated on this as they are single handily helping shape the Australian Cider Industry with innovation and tradition. I had an absolute blast tasting and reviewing this cider, and I reckon you will too. The Royal Melbourne Fine Food Awards is a celebration of what Australia has to offer with its diverse and premium food industry. But in 2013, the awards have a new inclusion. A inclusion which i personally am very excited about - a cider category!! As the RMFFA states, this program will be the first modern awards for cider in Victoria. We only just had the Australian Cider Awards held in Orange and Sydney in New South Wales back in October (and a huge congrats again to all the winners!). Rules for entry: All entrants must have 225L or over in stock of each product at time of entry - irrespective of class. Obviously, as more details come to hand i will throw it up on the blog, such as class criteria etc. Cider Styles - What's the difference? Cider Styles – What’s the difference? With cider consumption levels sky rocketing in Australia and New Zealand of present, it’s easy to get confused with the many various styles and types. Like beer, cider is not grounded by just one style or identity and comes in many different forms. These stylistic differences range from the common, well known ciders, to the ultra expressive and highly traditional. With consumers being constantly bombarded with new cider products, exposure to these differing styles in inevitable. But with the right knowledge on hand, choosing the right cider for the right occasion can become a whole lot easier and memorable. If you look closely this very minute, you will notice the ever growing presence of apple cider in retail liquor outlets. Consumers are really spoilt for choice in this category, as more and more Australian and New Zealand ciders are being produced. But as local apple cider becomes increasingly popular, so does the ever emerging range of imported ciders from countries like France and England. As a whole, they all have their own unique stylistic differences which offer loads of diversity and variety. The ciders being produced in both Australia and New Zealand are characterised by their fresh, clean and floral features. They are mainly made using the more traditional eating or cooking apple such as Pink Lady, Granny Smith or Golden Delicious. It’s the use of these apples that give the unmistakeable dry, acidic and crisp edge making them perfect served ice cold on a hot summer’s day. Filtered to brilliant, artificially carbonated and having an alcohol content at, or around 5%, this style of cider is really booming. It also helps that Australia and New Zealand have perfect apple growing regions like the Adelaide Hills, Batlow, and Moutere Valley. Stylistically, these types of ciders are relatively straight forward and can be rather one dimensional in their flavour and textural spectrum. But the more superior examples are able to capture the purity of the apple in the bottle, and really highlight the strength of the fruit. As cider increases in popularity, so does the curiosity to try new products from far and wide. Many different and fascinating ciders are currently being imported into Australia and New Zealand, and it’s now very easy to acquire them. What you see in these offerings is a thousand years of tradition, combined with traditional cider making methods. These ciders offer much more in terms of complexity, texture and authenticity through the use of traditional cider apples. These apples offer the fundamental characteristics of tannin structure, astringency, bitterness and sharpness, all the hallmarks of a traditional cider. France has two main cider producing regions consisting of Normandy and Brittany, which have been producing cider since the sixth century. Ciders from these two regions offer lower alcohol levels, with naturally sweet and naturally carbonated attributes. It is not rare to find a Cidre Bouché at or around the 2% alcohol content. A natural and traditional farmhouse process called keeving ensures that the cider retains residual sweetness and natural carbonation without filtration. It is most commonly cloudy, excessively bitter and astringent, but most importantly very complex. These characters of traditional French farmhouse cider may frighten many new cider consumers away but the complexity, authenticity and individuality is what makes these ciders. They also match very well with food such as pork and cheese, and can be consumed as an aperitif. English cider hails from the West Country in the counties of Somerset and Herefordshire. Gloucestershire, Worcestershire, Cornwall and Wales are also known to produce small quantities too. English cider comes in all shapes and sizes, from the mass produced made from concentrate, to the small artisan made offering. English cider is commonly vat aged, artificially carbonated, slightly astringent, pasteurised and filtered clear. Alcohol contents can range from the humble 5% to anywhere up to 10% for the vintage styles. A cider can commonly be a blend of up to 30 different cider apple varieties to help gain a balanced flavour profile. Single varietal ciders are also very common with varieties like Kingston Black, Dabinett, Yarlington Mill and Somerset Red Streak all perfect candidates. These ciders do lack the fresh, crisp punch to which the Australian and New Zealand ciders offer. But this is made up for by the use of superior cider apples along with deep rooted cider making methods and traditions. The term scrumpy is thought to be an historic term meaning to steal or gather old apples, from which they had fallen off the trees and began to shrivel. The history of scrumpy cider can be traced back to when the Normans conquered England in 1066. Since being introduced to cider, the English mastered the art of cider making and importantly the scrumpy style. These are the real traditional English ciders, where the cider itself is usually higher in alcohol, bottle conditioned, astringent, volatile and very cloudy. Scrumpy is commonly labelled as the most pure and hands off style of cider with no filtration, no preservatives and no water or sugar added. But unfortunately, constant referral as being highly alcoholic and aggressive has stigmatised the style. Alcohol contents are known to reach dizzying heights of 15%, which is heading into apple wine territory. Scrumpy is slowly becoming represented in Australia and New Zealand with some commendable, cleaner examples being produced. Overseas scrumpy imports, especially from England, are now also becoming readily available to the more curious cider consumer. Fruit flavoured ciders are fast becoming the new, trendy drink of choice when it comes to the every day cider drinker. The popularity of these new concoctions has exploded, and in a very short time frame too. Consumers are being exposed to fruit flavourings like wild berry, peach, mango and strawberry. The flavours are not just limited to fruit with ginger, vanilla and cinnamon for example all being represented. The authenticity of these ciders is questionable, and the term ‘cider’ is used fairly loosely with these products. One could argue that these beverages should not fall into the same category as traditional apple cider. Being made mostly to a recipe, the alcohol content is always in the 4% to 5% range. Stylistically, the ciders are angled towards being very sweet, lightly carbonated and somewhat refreshing. Combine these characteristics with often flamboyant and eye catching labels, and you have a formula for success. Perry, or Pear cider as it is also known, is only now becoming popular in Australia and New Zealand. What was misunderstood and unfamiliar, is now becoming accepted and sort after. Pear cider is much more delicate than its apple counterpart, usually being slightly lower in alcohol due to its higher level of non-fermentable sugars. Just like apple cider, there are two distinct forms of pear cider – the traditional and the new wave. Traditional perry which dates back to the fourth century often shows earthy, distinctive pear characters with lots of cloudiness, juicy sweetness, complexity and mouth sapping tannin. Australian and New Zealand pear ciders in comparison show crisper and cleaner features, combined with much subtle pear aromas. Pear cider is a very refreshing alternative to apple cider no matter what the style, and it is certainly sure to please. This article can be read in Beer and Brewer Magazine - Issue 23 Summer 2012.